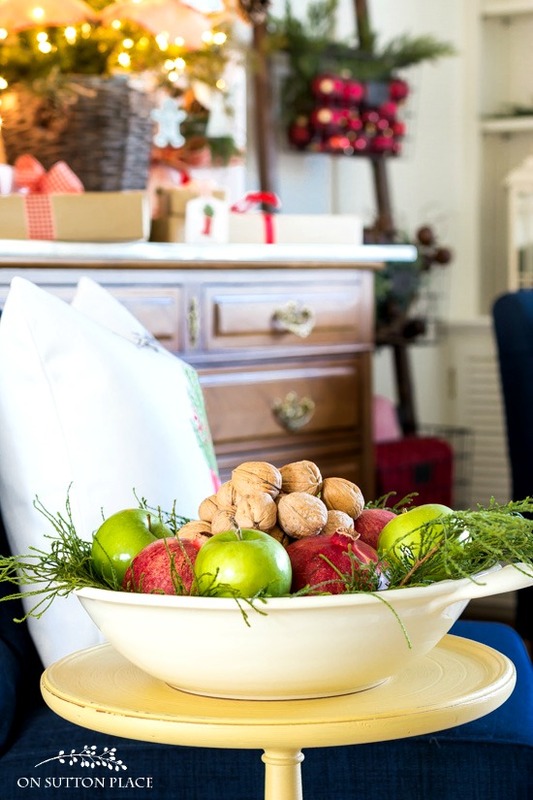 Take this Christmas home tour for easy & classic Christmas decor ideas! 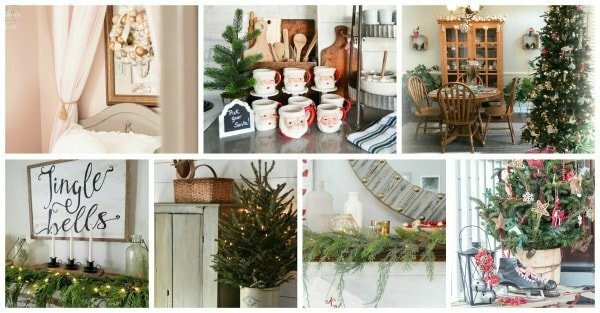 Today I want to welcome you into my home for a tour featuring simple yet festive farmhouse-inspired Christmas decor ideas. 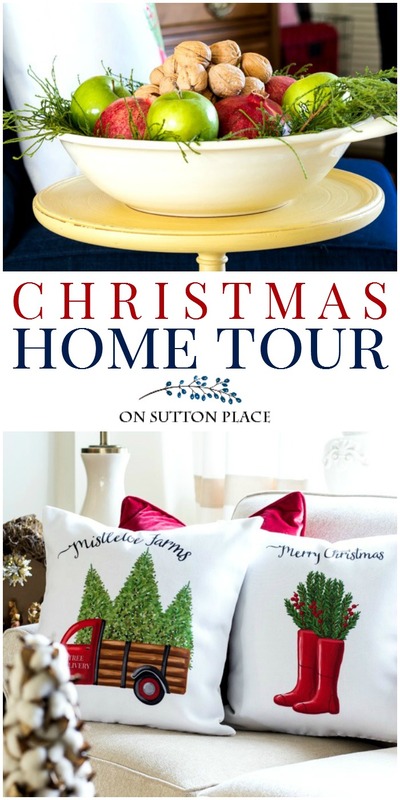 There is a huge bonus too because I am part of the Home for the Holidays tour hosted by Jenna from Wife in Progress. If you are coming over from The Everyday Home, welcome! More on the tour at the end of the post. 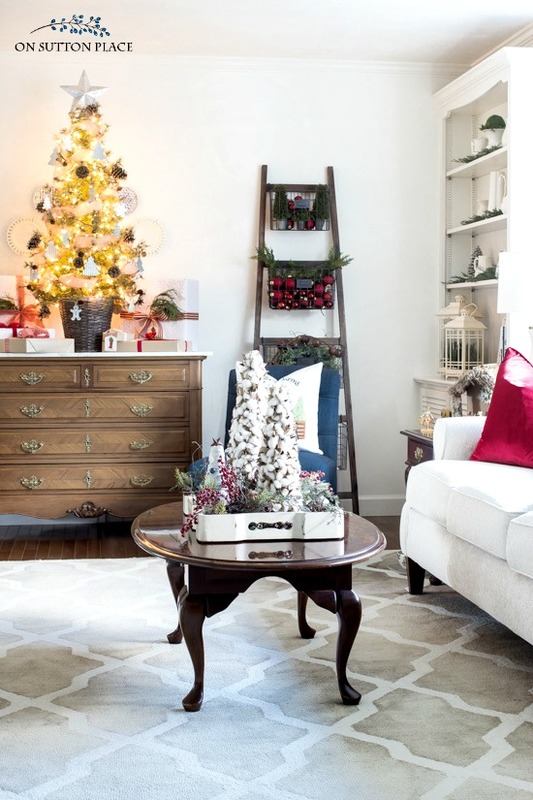 This year, more than ever, my Christmas decorating goal was a welcoming yet uncluttered look. All my family, including my new granddaughter, will be here so the house will be bustling! I kept everything simple with pops of red all over. I began with the front porch. To see more of the front porch click HERE. To see more of the entry, click HERE. If you are wondering about the grain sack bow: there are two posts that show exactly how to make the ribbon and the bow. 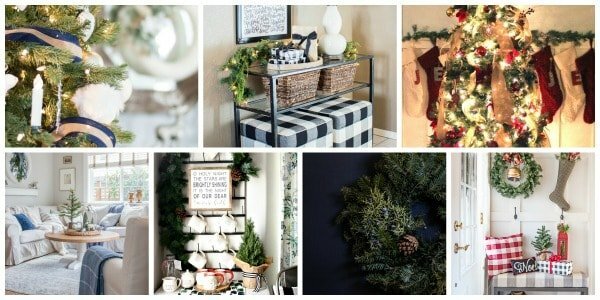 It’s always a challenge in the living room to come up with new Christmas decor ideas that make things look fresh and different. Some years I do better than others! This year, I had an idea when I saw this tutorial for adding ribbon garland to a Christmas tree. I decided to try it and breathe new life into my little table top tree. I bought a couple of rolls of burlap ribbon trimmed in red and wound it through my tree. I added new galvanized metal ornaments along with a star for the top. This simple update made me fall in love with my tree all over again. 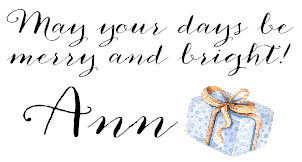 See my gift wrapping post HERE. here is the rest of the living room! Last but not least, is the dining room. To see the rest of the dining room, click HERE. *Some links lead to websites where I am an affiliate. Click for my disclosure statement. As a thank you for participating in their blog hop, Kirkland’s sent me the ladder with the baskets. It was such a lovely surprise and much appreciated. I gave my vintage blanket ladder to my daughter and she was thrilled as well! *I got the tree ornaments at JoAnn and the tree ribbon at Hobby Lobby. Neither are available online. 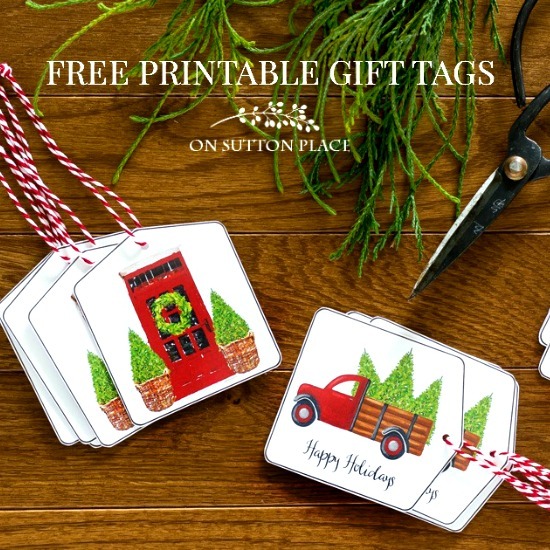 Sutton Place Designs Christmas collection! If you made it to the end, thank you so much! Now it’s time to send you along to Kendra’s tour at Joy in Our Home. I hope you have a little extra time to check out some of the other tours that are linked below. There is so much inspiration and easy ideas you can adapt to your own homes. 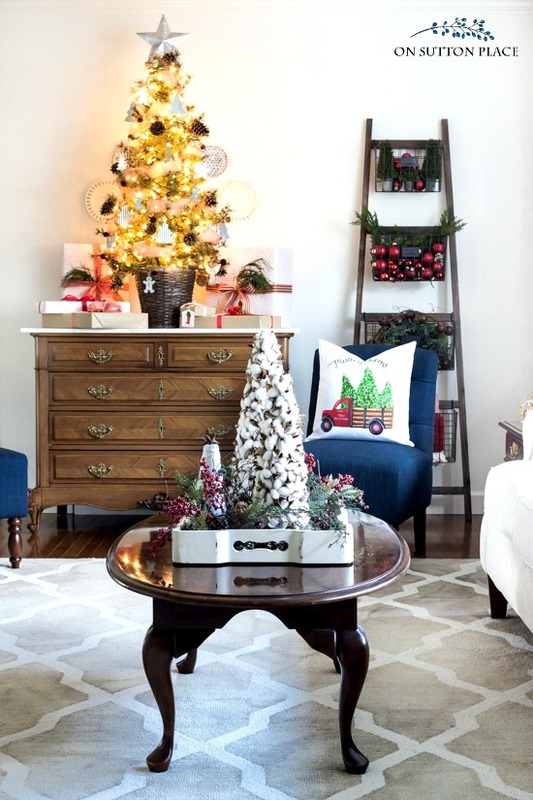 New comer to your blog and I love your Christmas home tour. I know it is February but never too soon to look for Christmas ideas. I know I am going to love all you offer. Your house looks Merry and Bright and i wish you a Merry Christmas. Have a good time with your grand child and family. Really so beautiful! Love how cotton bill trees! I’ve never seen those! Your whole home is beautiful! Everything is beautiful. I especially love the pillows. On Sutton Place is always a place of inspiration. Thanks for sharing. I love your tabletop tree! 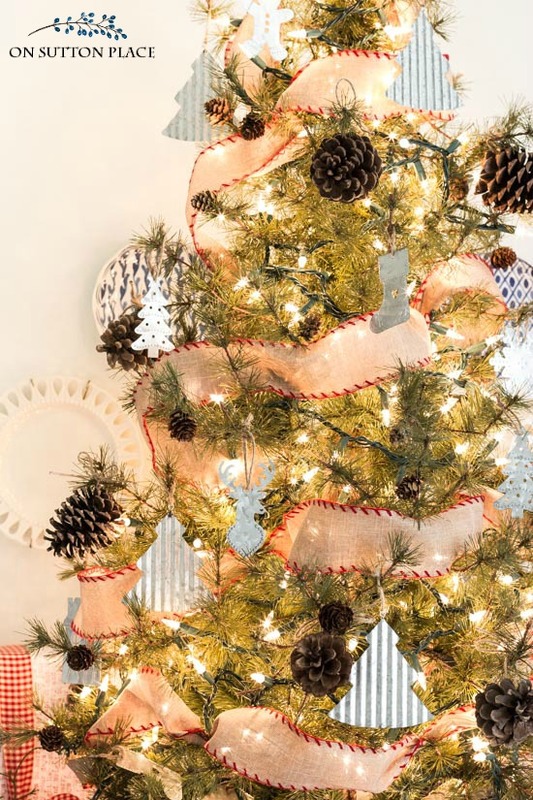 Those pinecones and tin ornaments are so adorable! And the way you styled that ladder is so festive! Love all your holiday touches! 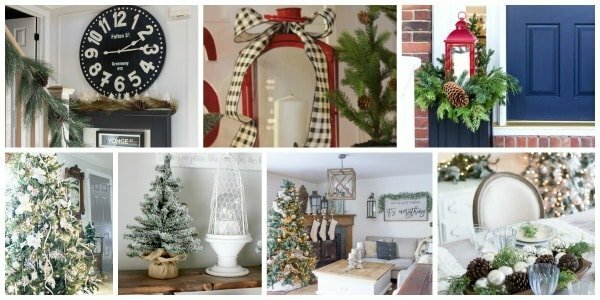 Your home is always a source of inspiration and I love seeing it all dressed up for Christmas! So beautiful! This is all so pretty! 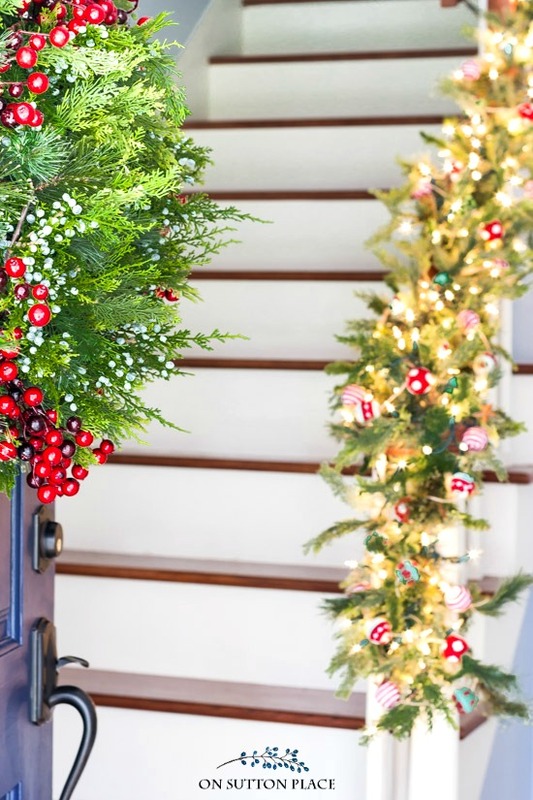 The garland on your stairway is absolutely stunning with the lights and colorful ornaments! Very beautiful. It’s a magical aesthetics of Christmas. Such posts inspire me so much! Christmas is the most magical time of the year. Thank you, Ann. Merry Christmas! If anyone knows how to pull traditional Christmas together well it’s you my friend. Merry Christmas! I love your pillows! How did you print it out large enough to cover the pillow? Hi Sharon…the pillow covers are available in my online shop. It’s a print-on-demand site so they actually do the printing for me. The link is in the post. Thank you! Gorgeous!! Warm, inviting, a pleasure to view!! Dear Ann, I so enjoyed looking at your Christmas house tour. Wishing you and your family a very Merry Christmas! Congratulations on becoming a Grandma Ann! I’m a new one too, to a beautiful Granddaughter last Spring :). I’ve always love how you decorate your tabletop tree. Very exciting to have Christmas with your family in your renovated home with beautiful Christmas decorations:). lovely! 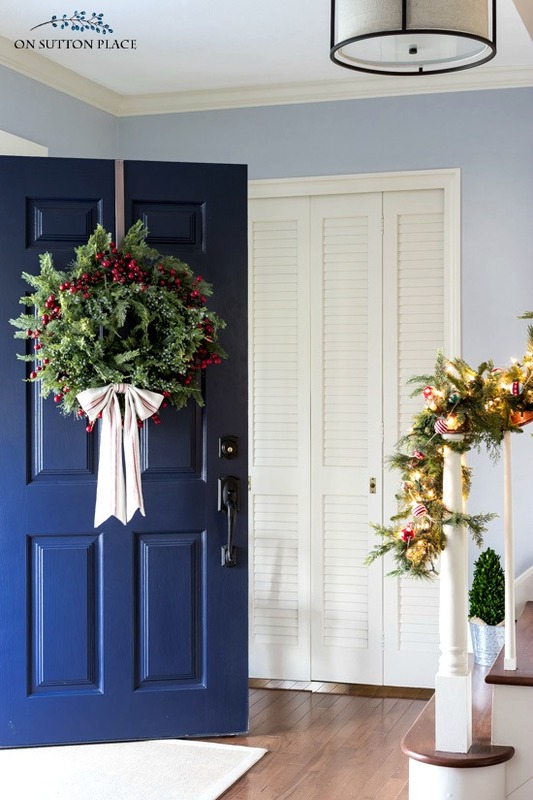 and I had to laugh bc as soon as I saw that front door wreath I DID wonder about that bow! Can you tell where your sofa is from? I really like it. Hi Amber! The sofa is from Artvan and is from the Chloe II Collection. Fabric is Desire Pearl. Thanks! It all looks so festive and cozy! I love your pillows and that tree on the buffet! Wait…you have a new granddaughter? How did I miss that news? :) Congratulations!!! All of your decorations are beautiful! Ann, it all looks so wonderful, as always! A beautiful home to spend the holidays in! Merry Christmas! Your home looks stunning, you’ve done an amazing job. 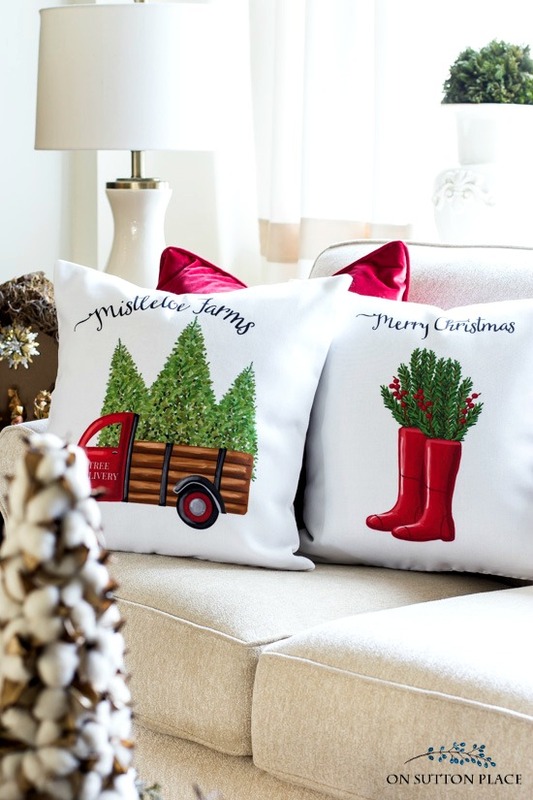 Love all your decorations and especially those sweet pillows. Ann, your home looks beautiful! Everything is beautiful,but I love the ladder with the wire baskets so cute Merry Christmas & enjoy that new baby. 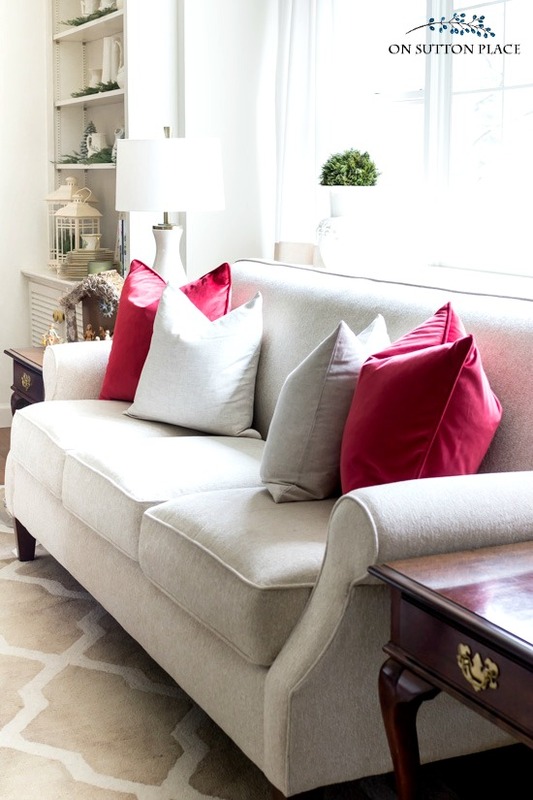 Love RED in your home, always a great job Ann, Merry Christmas! Stunning as always, Ann and your home looks so warm and cozy. Your family and new granddaughter are going to have such a wonderful Christmas there! Happy holidays and thank you so much for participating in this blog hop! Your home looks lovely, especially the dining room. I have never had a formal dining room to set ahead of time. Each glance into your dining room makes me want to stop by and take a peek in person. Thank you. And congratulations on the new grand baby. How exciting! I love your decorations! Especially the ladder with the wire baskets. Brilliant. And, the bookcase looks beautiful! Your Christmas dishes are my favorite pattern and your table setting is gorgeous. I love your newsletter & use a lot that you share. Thank you & Merry Christmas. I wanted to take the time to personally thank you for your generosity in sharing not only your wealth of decorating knowledge, your beautiful home, recipes, etc. but also the yearly planner for 2018. I am giving my printer a workout today creating my planner for 2018. I sincerely appreciate the beautiful work and thoughtfulness that has gone into designing it. I was a Franklin Covey fan years ago (in my former working life) and now that I spend my time creating at home your planner is so fitting to my lifestyle. Next off the printer will be your Christmas Gift Tags…that is after I give my printer a break!!! I love everything you have done, Ann. 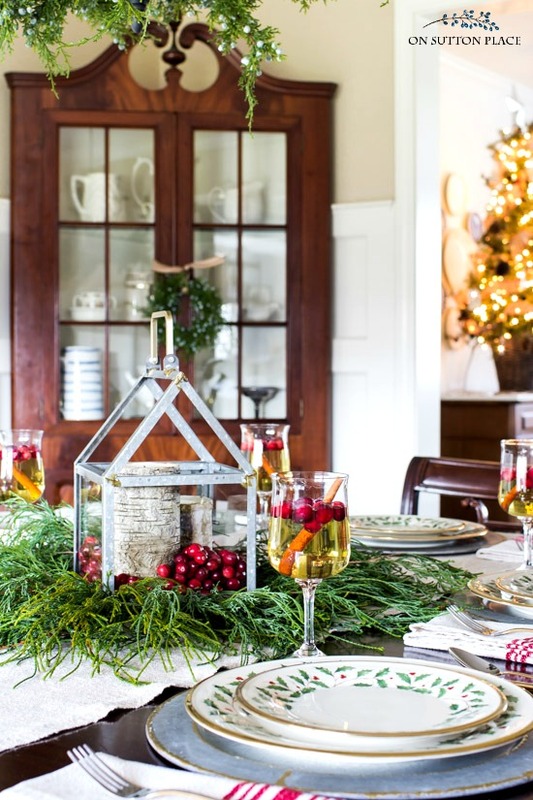 So pretty and festive without being overdone. It is all very nice. I think I first noticed your blog from the floral alphabet. Now I’m paying closer attention to things, since I’ve recently started my own project blog. Did you design your own logo? It looks sooo nice. I have some ideas for my logo, but no idea how to go about it. If you physically draw/ color your own logo, then how do you get the digital version to be so nice? Oh, I’m wishing I knew more about Photoshop and those things….but I am learning, little by little. 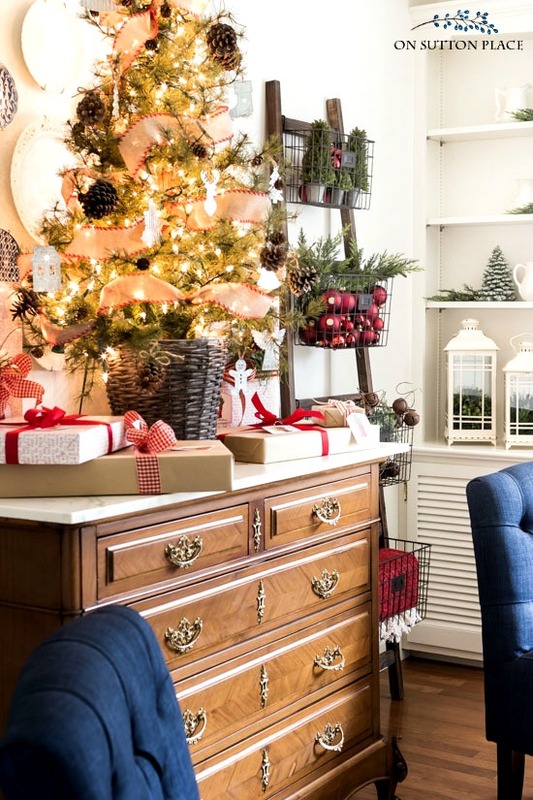 I love the baskets of ornaments and greenery! Ann, I think you’ve nailed it!! Pops of red is beautiful and that little tree is amazing. You have a beautiful home with great ideas. Oh Ann, you’ve just got the most beautiful home! Everything looks so cozy all decked out for Christmas! Your home is lovely,I especially love the ladder with the baskets, the tabletop tree.The white lanterns and Christmas platter look so pretty in the bookshelves. I love seeing the beauty in your home! Thank you for sharing! Beautiful, beautiful, beautiful. I love the wire baskets on the ladder and how you create little vignettes in trays both as centerpieces on a dining table and on your coffee table in the living room. Not sure why but that makes it even more special. 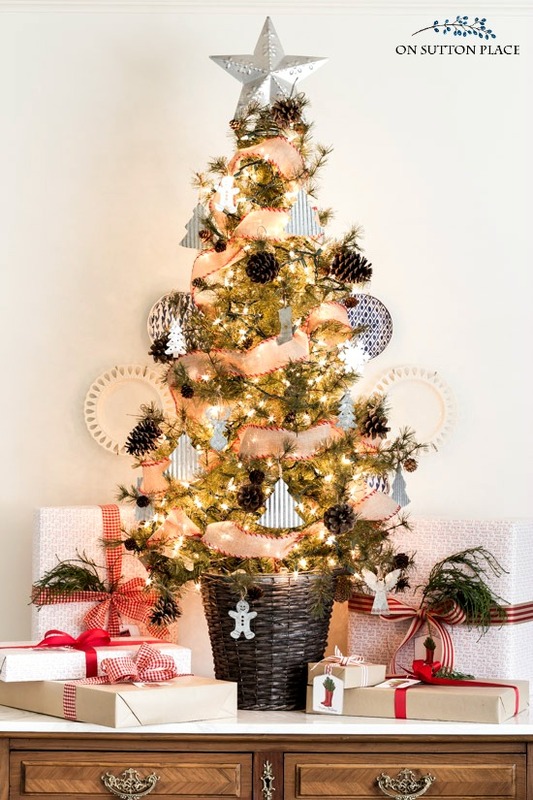 Love the burlap ribbon on the Christmas tree. 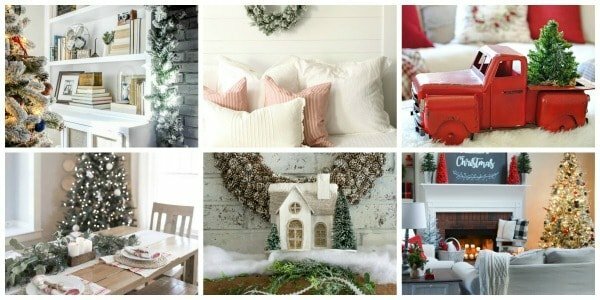 Nothing is overdone but yet there is something pretty and festive to look at everywhere in the house. Great job! Yes, I especially loved the wire baskets on the ladder too! So very pretty, Ann. Merry Christmas. Thank you for sharing your Home and especially the free printables. I had to retire due to a health disability. Although my husband is retired, he went back to part time work to pay for our ten-year-old son’s (adopted grandson) Christian education. Your free printable have helped to decorate our home. Blessings. Ann, love those pillows on the sofa! We have the same Christmas china and it looks wonderful in any setting. Your tree on the buffet is so bright and such a statement. Happy to be back on another blog hop with you. Great ideas. Loved the tour. Your home & decorations are beautiful. The ladder with the baskets is awesome. Have a Merry Christmas!!! Thank you for all the free printables, it is so generous of you. I love, love, LOVE your style, Ann. Unique, clever, understated, elegant. 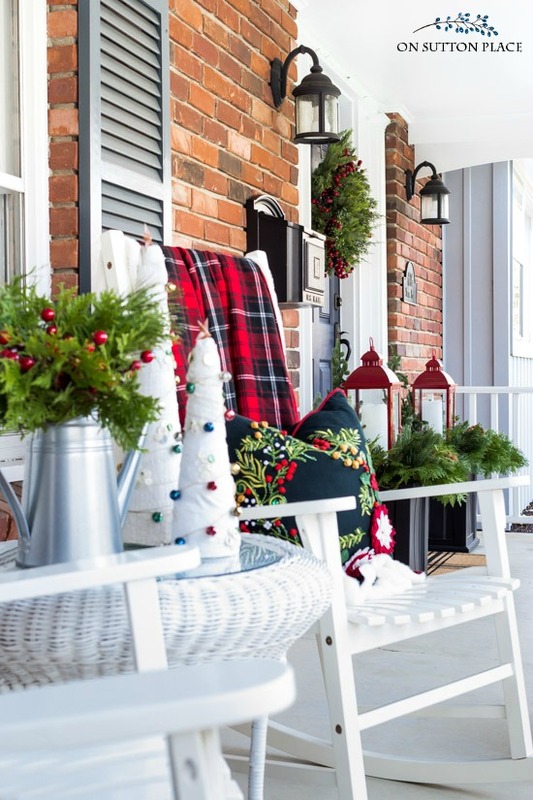 From the front porch’s red lanterns in the urns to your precious little burlap and aluminum tree, it all says ‘welcome home’ and ‘Merry Christmas’ to me. Thank you for sharing a slice of your life w/us. Just beautiful Ann..love the tree & the cotton tree..Your home is always lovely! 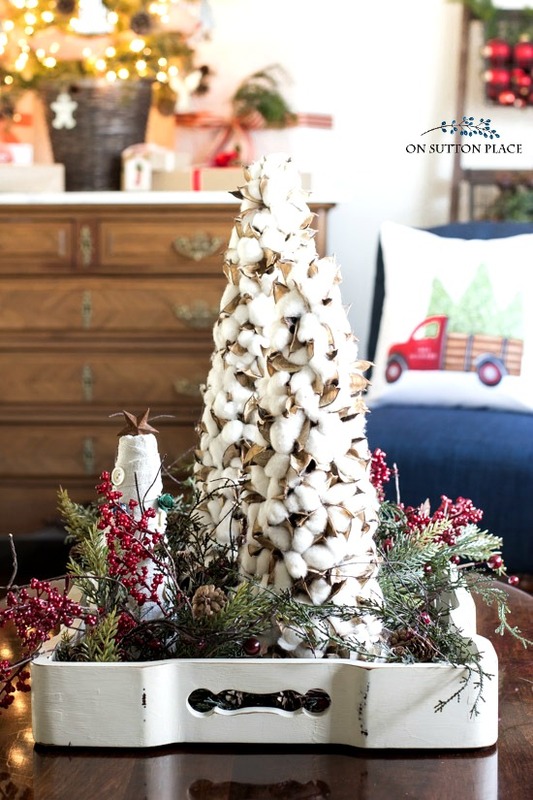 Are the small Christmas trees on the coffee table in the living room made of cotton stems? I love the way they look. As a child going from the gulf coast of Texas to New Mexico dad would stop so I could get some cotton that was missed or dropped by the machines. I love those trees. Hi Lynn…yes the trees are made from cotton bolls. I did have a link for them but I just checked it and they are now sold out. Merry Christmas! Your home is so cozy and beautifully decorated Ann! 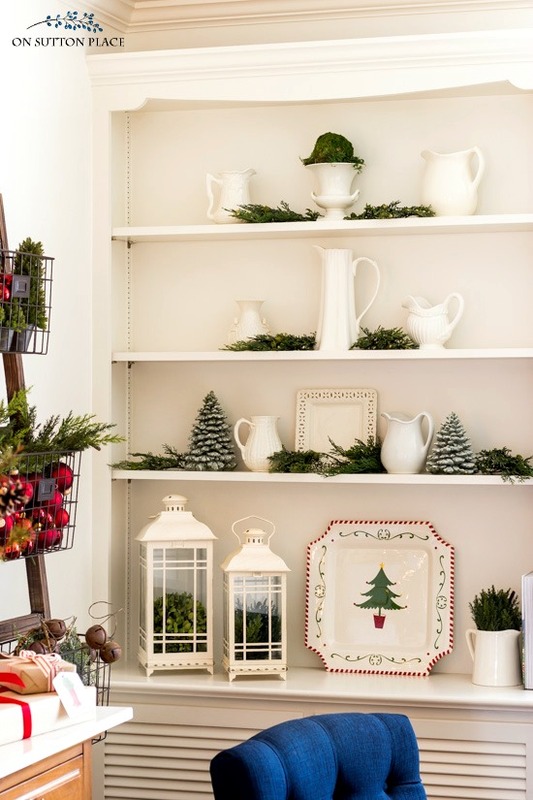 I love that ladder from Kirklands aND the baskets filled with decor! So happy to be on this tour with you… Merry Christmas! such a warm and inviting home, looks absolutely lovely.. Thank you for the decorating ideas for the porch. I now have pillows on the rockers and on the vintage glider. I love the lantern idea and have replicated it with my lantern. I have printed the gift tags and know they will be a hit this year also. Merry Christmas!. I love the ladder next to the built in. Did you make this yourself? Are the baskets screwed in love love it!!! I love your pretty home all decked-out for Christmas! But my favorite is the coffee table vignette. The cotton tree is so cute. Being Southern I love that! I think your decorations are lovely. Your home looks beautiful. I wish I had your eye for decorating. Thank you for sharing. I love looking at beautiful places. Beautiful, homey, warm and inviting and decorated with love. Your family will have a wonderful Christmas and holiday season. Think of all the fun you will have with your new granddaughter down the road making cookies and inspiring a new generation. Many blessings, love and happiness to you and your family in 2018. Dear Ann, I follow your OSP from Brazil. Although I never comment, your ideas have been inspiring me for quite a long time. 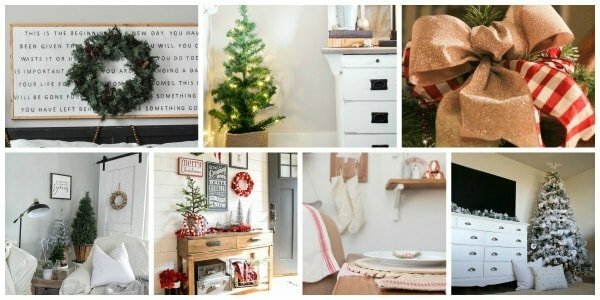 Your home is looking gorgeous this Christmas! Sua casa está tão linda para este Natal! Thank you for all the beauty you share! Have a Merry Christmas, and a New Year full of joy and love. Your home is absolutely gorgeous! Your talent is great!!! Merry Christmas! !